Hello and welcome to the 753rd installment of the SWD. Improvised explosive device wounded an element of Hayat Tahrir al-Sham near Khan al-Assal in western Aleppo. Syrian Democratic Forces arrested six individuals accused of targeting civilians with improvised explosive devices in the city of Raqqa. Russian Navy’s battleships reportedly launched two long-range missiles targeting the city of Jisr al-Shughur in western Idlib. According to the Syrian Civil Defense (The White Helmets), 12 civilians were wounded by the aforementioned targeting of the city. Improvised explosive device killed one and wounded two civilians in the city of Al-Dana. Similarly, an improvised explosive device wounded two civilians near Al-Abrar mosque in Al-Muhandisin neighborhood of Idlib city. Improvised explosive device targeted a vehicle of Faylaq al-Sham, wounding an element in the city of Kafr Nabl in southern Idlib. Russian Air Force conducted several air raids over the city of Kafr Zita in northern Hama. According to the Syrian Civil Defense (The White Helmets), one civilian was killed and ten were wounded by the air raid. 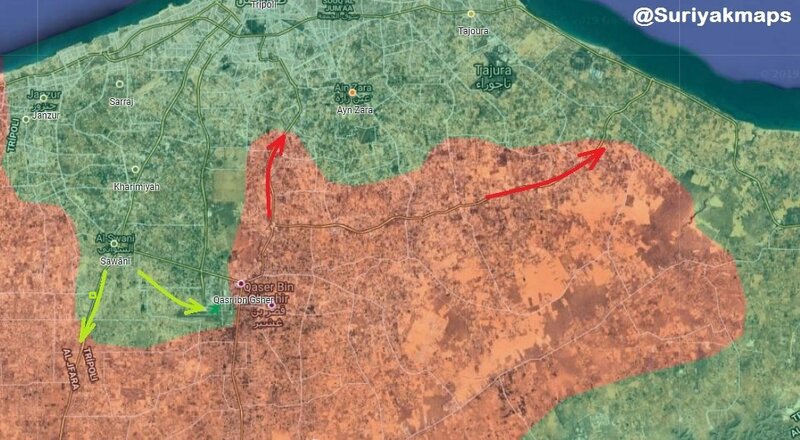 Government of National Accord’s forces launched a counterattack against the Libyan National Army and regained the Tripoli International Airport, as well as Al-Hira and Al-Aziziyah areas. Libyan Air Force conducted air raids over the Mitiga International Airport in Tripoli city, which resulted in the airport’s closure until further notice. Two elements of the Afghan National Security Forces surrendered to the Islamic Emirate of Afghanistan (Taliban) in Laja Mangal district. Afghan National Security Forces allegedly killed 35 and wounded 22 elements of the Islamic Emirate of Afghanistan, as well as destroyed 35 vehicles and several weapons depots and ammunition caches in Murghab district, according to the Afghan Ministry of Defense. Islamic Emirate of Afghanistan killed five and wounded seven elements of the Afghan National Security Forces during clashes in Murghab district. Islamic Emirate of Afghanistan’s improvised explosive device targeted an Afghan National Police’s vehicle, killing two and wounding four policemen in Gelan district. Not the “Syrian Civil Defence” – there is a real one. The White Helmets are foreign funded, staffed and provide propaganda services for MI6.